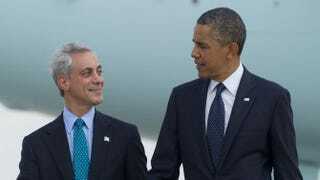 Chicago Mayor Rahm Emanuel announced plans on Thursday to build a high school and name it after hometown hero President Barack Obama, the Associated Press reports. The Barack Obama College Preparatory High School, which is slated to open for the 2017-2018 school year, will be a selective-enrollment high school. Officials at Chicago Public Schools told AP that the school will eventually have an enrollment of some 1,200 students but will open with a freshman class of 300 students, with subsequent grade levels to follow. Although CPS is the nation's third-largest school district, with 400,000 students in 658 schools, it has only 11 selective-enrollment high schools, AP reports. School officials told AP that this school year, some 16,500 students applied for 3,200 seats in those selective-enrollment schools.